Seasonal lag is the phenomenon whereby the date of maximum average air temperature at a geographical location on a planet is delayed until some time after the date of maximum insolation. This also applies to the minimum temperature being delayed until some time after the date of minimum insolation. An analogous temperature lag phenomenon occurs in diurnal temperature variation, where maximum daily temperature occurs after noon (maximum insolation). The amount of Sun energy reaching a location on Earth ("insolation", shown in blue) varies through the seasons. As it takes time for the seas and lands to heat or cool, the surface temperatures will lag the primary cycle by roughly a month, although this will vary from location to location, and the lag is not necessarily symmetric between summer and winter. The diagram uses neopagan labelling; Litha is the summer solstice, Yule is the winter solstice, Ostara is the vernal equinox, and Mabon is the autumnal equinox. Earth's seasonal lag is largely caused by the presence of large amounts of water, which has a high latent heat of freezing and of condensation. The length of seasonal lag varies between different climates, with extremes ranging from as little as 15–20 days (for polar regions in summer and continental interiors, for example Fairbanks, Alaska, where annual average warmest temperatures occur in early July, and August is notably cooler than June) to as much as 2½ months (for oceanic areas, whether in low latitudes, as in Miami, Florida or higher latitudes as in the Kuril Islands, where at Simushir annual average temperatures peak in late August), and at Cape Sable Island in Nova Scotia, Canada, where (by a slight margin) September is actually the year's warmest month on average. 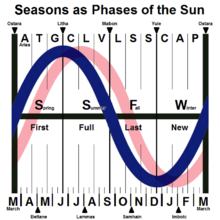 In many locations, seasonal lag is not "seasonally symmetric"; that is, the period between the winter solstice and thermal midwinter (coldest time) is not the same as between the summer solstice and thermal midsummer (hottest time). In much of East Asia with oceanic influences, including Korea and virtually all of Japan, January is the coldest month, but August is the warmest month. In low and mid latitudes, the summer lag is longer, while in polar areas the winter lag is longer (coreless[clarification needed] winter in interior Antarctica and Greenland). In mid-latitude continental climates, it is approximately 20–25 days in winter and 25–35 days in summer. San Francisco, for example, has an exceptionally long seasonal lag in the summer, with average daily temperatures peaking in early to mid-September, and October as its second-warmest month, but very little seasonal lag in the winter, with the lowest temperatures in late December and early January, around and soon after the winter solstice. This is caused by the water in the Bay Area surrounding the city on three sides. Many areas along North America's west coast have very small winter lag and are characterized by a much more gradual spring warming and relatively more rapid autumn cooling. Due to seasonal lag the autumnal equinox is considerably warmer than the vernal equinox in most regions. However even with seasonal lag the autumnal equinox is cooler than the summer solstice in most regions as well as the vernal equinox being warmer than the winter solstice even in most oceanic areas. In eastern Canada the seasonal lag is consistent both in summer and winter, resulting in February and August being the coldest and warmest months, respectively. In Western Europe the lag is lower in spite of the Atlantic coastline, usually around a month, which is also consistent with many inland areas in the North American Midwest. In Japan, Korea and nearby areas (for example, Vladivostok, Russia), seasonal lag is stronger in summer than winter; the coldest month is January, while the warmest month is August, possibly due to enhanced cloud cover and rain during the early summer, June into mid to late July (for example, the "tsuyu" rainy season in Japan over the same period). Other planets have different seasonal lags. The gas giants Jupiter, Saturn and Uranus, as well as Saturn's moon Titan, all have substantial seasonal lags corresponding to the equivalent of between two and three months in Earth terms. Mars, on the other hand, has negligible seasonal lag of no more than a few days. For the case of Venus no seasonal lag would be detected, because the planet undergoes no seasons due to very efficient heat transport in its massive atmosphere. This is also the case for Mercury, even for its "anomalistical seasons", since it has negligible atmosphere and so undergoes almost instantaneous heating and cooling. ^ "Seasonal Temperature Lag - WeatherWorks". www.weatherworksinc.com. 21 July 2014. ^ a b "radiative time constant". PDS Atmospheres Node. Retrieved 2018-11-17. ^ "Why is March colder than September in Northern Hemisphere?". Earth Science Stack Exchange. ^ "London Monthly Climate Averages". WorldWeatherOnline.com.